over the past couple weeks i worked on a super exciting feature with the creators of wovenmagazine!!!! a west coast based magazine who captures the stories of makers, artist & thinkers. 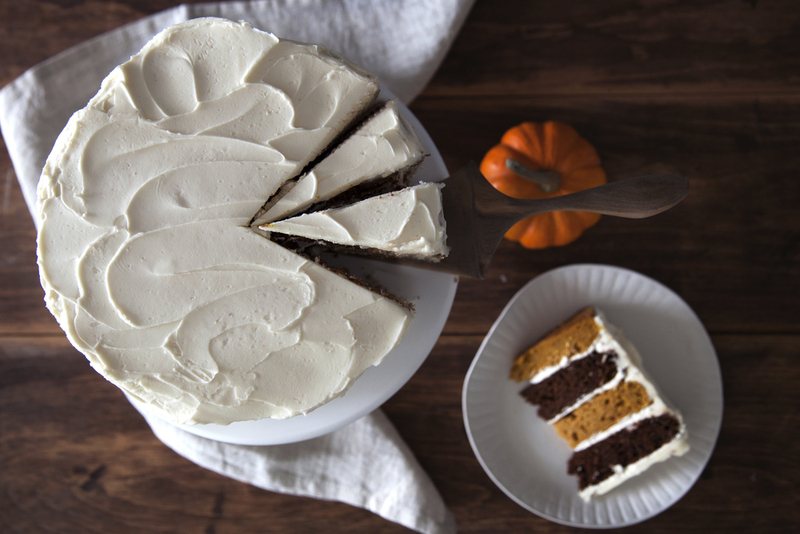 check out the interview with me + the recipe for this pumpkin chocolate layer cake! both the pumpkin & chocolate layers are made with fresh pumpkin. make this for an upcoming halloween party or have it grace your thanksgving holiday table. it might just be better then pumpkin pie (yeah i said it). for the pumpkin cake: in a mixing bowl add sugar, eggs, pumpkin, oil & vanilla. Mix until the ingredients are well combined & the eggs are light/fluffy. In a separate bowl sift the flour, baking soda, baking powder, salt, cinnamon & nutmeg. Slowly add the dry ingredients to the wet ingredients, alternating with the milk. Stir until a smooth batter is formed. Grease & flour two 9-inch round cake pans, divide batter equally amongst the two. Bake at 325 degrees for 20-25 minutes, until a toothpick comes out clean. for the pumpkin chocolate cake: while the pumpkin cakes are in the oven, begin making the chocolate batter. In a mixing bowl add sugar, eggs, pumpkin, oil & vanilla. Mix until the ingredients are well combined & the eggs are light/fluffy. In a separate bowl sift the flour, cocoa powder, baking soda, baking powder, salt, cinnamon & nutmeg. Slowly add the dry ingredients to the wet ingredients, alternating with the milk. Stir until a smooth batter is formed. Grease & flour two 9-inch round cake pans, divide batter equally amongst the two. Bake at 325 degrees for 20-25 minutes, until a toothpick comes out clean. for the buttercream frosting: once both your cakes have cooled completely, make your frosting. In the bowl of a stand mixer using the beater attachment (or using hand held beaters) add your butter, sugar, and vanilla. Whip until light & fluffy, about 8 minutes. to assemble: Start with the pumpkin layer, a generous amount of frosting followed by the chocolate pumpkin layer. Repeat. Frost the outside of the cake as desired.